Why not add a little color and charm to your desktop with the Movin’ And Groovin’ Snakes? 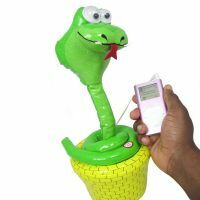 No water is required for these groovy reptiles, all you have to do is plug in the 3.5 mm jack connector to your multimedia device, crank up the volume and enjoy the show as they move and groove to the beat of your music. Movin’ and Groovin’ Snakes also boast pretty decent speakers too and they will pump out your favourite tunes with clear, rich sound and surprising muscle for their cheeky guise. There is even a three-way switch which lets you select music and dance, or just music, depending on your mood. You don’t need to pick up snake charming skills from the east to get these reptiles swaying to your brand of music. The Movin’ And Groovin’ Snakes will retail for £19.95 each, and are available in brown, purple and green colors.